In November 2017, The Egyptian Government implemented a new e-Visa scheme to make it easier to travel to Egypt and to speed up the process at border control. The application process is quick and simple. It involves providing some basic information. The e-Visa allows visitors to spend up to 30 days in the country and it is valid for 90 days from the date it is issued. 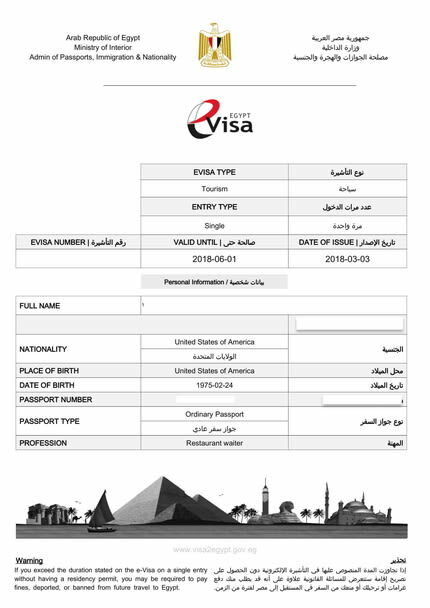 An e-Visa is an official document permitting entry into and travel within Egypt. Once your application is approved, we recommend you print a copy of the document to carry with you. The destination location name and street address. Egypt e-Visas are issued for single or multiple entries to people whose nationalities require visas to enter Egypt. Your Egypt e-Visa is valid for 90 days after issue. The maximum stay in Egypt is 30 days. Parents can apply for their children from the parent’s account. Super rush processing times for Egypt e-Visas are approximately 3 working days. If you exceed the duration stated on the e-Visa without having a residency permit, you may be required to pay fines, be deported or be banned from future travel to Egypt. The Egypt e-Visa is not required for visitors from the US, the EU or the UK who are traveling to (and remaining in) Sharm El Sheikh, Dahab, Nuweiba, and Taba. As long as their trip is under 15 days they can travel visa-free. Applicants must hold an ordinary passport for at least six months from their arrival date. It is recommended that you have at least one blank page in your passport to get the stamp. After the application has been submitted and approved, the traveler needs to print at least one copy of the visa. You will need to present your printed e-Visa to the immigration officer at the port of entry. The e-Visa is an authorization document that allows visitors to enter Egypt. The Egypt e-Visa is valid for 90 days after issue. This means you must enter Egypt within 90 days from the date of issuance. This applies to both single entry and multiple entry e-Visas. The e-Visa must be printed on a sheet of blank letter-sized white paper. Double-side or reduced printing will not be accepted. All European Union citizens (including the UK), Albania, Australia, Canada, Iceland, Japan, North Korea, South Korea, Macedonia, Moldova, Monaco, Montenegro, Norway, Russia, Serbia, Switzerland, Ukraine, The United States and Vatican City. You will not need one if your transit time/layover will be less than 48 hours (you must show your onward flight ticket). Leaving the airport may be permitted but you will have to hand over your passport. You will need to inquire with your airline, as many offer short duration tours to their passengers with transit times/layovers between 6 and 48 hours. What documents should I provide upon my arrival at Egypt? Passport valid for at least six months after the arrival date. Supporting letter, e.g. letter from company or invitation letter for business/family visits. Hotel bookings/details about places you plan to visit if you’re going as a tourist. I am traveling with children, do I need to create an account for them to apply? No, you do not. Parents can apply for their children in conjunction with their own application. How far in advance should I apply for the Egypt e-Visa? You are advised to create an e-Visa application at least 7 days before your departure. Multiple entries give you 2+ entries within the visa validity period of 90 days, with each stay being no more than 30 days. You would think that planning a trip to Egypt is easy, but many people fell into that trap and had not such a pleasant experience. In comparison with other countries, Egypt is a fairly difficult country to explore. Looking at the pyramids or visiting the Sphynx is not enough, and that will probably take you only a day. So what do you do with the rest of your vacation? Sitting in one place would be a waste of experience. Plus, I bet that there are a ton of other things that you do not know about Egypt, which is why this article should help you out. One of the first things that you should probably know is that Egypt has a lot of history, and it goes beyond Cleopatra. There are a lot of other interesting things to learn, things that you do not want to look for on Google. You can do that at home if you like. That is why my advice is to refer to a tour guide. There are plenty of them, and they are generally very good at their job. They have this talent of presenting the history of a particular location with passion and involvement. You could browse the reviews online to see which guide is the best. You will not accompany one the entire trip, but a day or two is necessary. That is if you want to learn more about Egypt without going on Wikipedia. Before you go to Egypt, one of the things that you must absolutely do is get travel insurance. You will not be treated for common diseases if you are not insured, and most insurance policies do not have international coverage by default. Plus, getting medevaced from the middle of Egypt will most certainly burn your pockets to the ground. Get travel insurance and have some peace of mind. Plus, it comes in handy if your luggage gets lost or stolen, or if your flights are canceled. One of the things that you need to try in Egypt is the food. However, this one can be tricky, since not all places are sanitary. To say the least. If you have a sensitive stomach, you are pretty much at risk for every bug there is. Even people with strong stomachs can get infected with something. Even so, there is a simple but brilliant trick that can save you a day from sitting on the toilet or medical care, and that is choosing the place where you eat wisely. When I say wisely, I mean that the best place to eat is where the locals eat. If you see a long line at a stand on the sidewalk, that is the place where you want to go. Locals know where the food is good and healthy, which is why you should follow them. If you see a street vendor or a restaurant with no customers, instead of rushing to it and being happy that you do not have to stand in line, you would best stay away from it. An aspect that you may find squeamish is that you need to BYOTP. You need to have toilet paper on you at all times. Public restrooms rarely have some, and it is most likely that you will find a nozzle that can help you wash. However, I do not know how open you are to that since very few tourists are. That is why your own toilet paper will save you a lot of trouble. Just put some in your bag or backpack and rest assured that you do not have such issues as you explore the location in which you are. If you find yourself in Cairo, and almost all tourists go there when in Egypt, you should know that you can find Uber. Almost everyone rides Uber these days and Cairo is on the map. That is if you do not want to use the metro system. Plus, the fares are more than affordable and it is the ideal way to get around. In Egypt, there are a lot of places where you can buy all kinds of souvenirs. You can purchase small pyramids or a miniature Sphynx. Plus a whole lot other items. However, Egyptians like to haggle on almost everything. They have their fun even for a bottle of water at the corner store. Plus, if you do not have the skill, they win some extra cash. That is why you should always haggle. You can save some money, have some fun, and nobody will get offended for making an offer. At the same time, you need to be careful about scammers. There are plenty of it in Egypt. They will say or do anything just to get some money, which is why you should be aware and always be careful. Do not let yourself fooled. When you are packing, make sure that you take comfy shoes for your trip. You will walk a lot, and the weather is hot. You can wear flip-flops at times, but a pair of comfortable running shoes are the best choice. As for apparel, you should know that some places have rules that are best for you to follow. For example, if you are a woman who visits mosques or other religious sights, you should always wear clothes that cover your knees. A headscarf is a must inside mosques. And you cannot enter one with your shoes on. As for men, even if the weather is nice, you cannot wear sleeveless shirts or gym apparel. Bikinis and beachwear are acceptable only at the resorts along the Red Sea. Taking a trip to Egypt may require some research before leaving, but you should easily get the hang of it. Remember to always stay hydrated because the sun and the heat will bring you down. At the same time, do not forget to pack some extra layers, because as hot as it may be during the day, Egypt nights and evenings are quite chilly. You will be looking for that cardigan you did not want to pack because it occupied too much space in your luggage.